Wing span: 1 7/16 - 1 15/16 inches (3.6 - 4.9 cm). Identification: Fringes are brown. 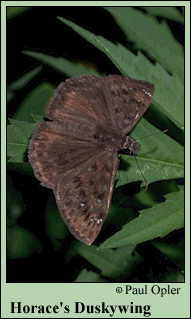 Upperside of male forewing is dark brown with little contrast and no white overscaling. Upperside of female forewing is light brown with a contrasting pattern and large transparent spots. Underside of hindwing is usually without 2 spots below the apex. Male has a costal fold containing yellow scent scales; female has a patch of scent scales on the 7th abdominal segment. Flight: Two broods in the north from April-September, three broods in the Deep South and Texas from January-November. Caterpillar hosts: Both red and white oaks including willow oak (Quercus phellos), northern red oak (Q. velutina), scrub oak (Q. ilicifolia), water oak (Q. nigra), post oak (Q. stellata), and live oak (Q. virginiana). Adult food: Horace's Duskywing visits flower up to about 4.5 feet tall including dogbane, buttonbush, sneezeweed, goldenrod, peppermint, boneset, and winter cress. Habitat: Open woodlands and edges, clearings, fencerows, wooded swamps, power-line right-of-ways, open fields, roadsides. Range: Massachusetts west to eastern South Dakota; south through most of the eastern United States to Florida, the Gulf Coast, and South Texas; south in the west through southeastern Utah, Colorado, northeastern Arizona, and New Mexico.